The majority of people will experience at least one episode of low back pain some time in their life. Most people who do experience back pain once will have reoccurences. People generally also understand that to help prevent pain, they should exercise and stretch. Unfortunately, that’s about the limit that most people know. When you are experiencing an acute bout of back pain, there are some things that are recommended more than others. For acute pain, the first thing is rest, and then of course light exercise that does not exacerbate your pain (hey, I’m a physical therapist, what else would I recommend?). This can include walking, stretches, and basic core exercises. Manual therapy is also a great way to temporarily relieve back pain and this can include different types of massage, spinal mobilizations or manipulations (called many different things including “adjustments”). Also, some alternative medicines have also been shown to be better than placebo, including acupuncture. Modalities can also help as well, including ice or heat (generally whichever one feels more comfortable), electrical stimulation, ultrasound, etc. But of course, you’re not reading this because you want a temporary solution that just masks the symptoms, you want the thing that is most likely to prevent back pain in the future! And of course, that’s movement re-education, which begins with exercise. Most people have heard that to help with back pain, they should either strengthen their abs or back. These are both partial truths. People who have had pain often have muscular imbalances, but the imbalance isn’t always with the back and front. The imbalance in muscle strength is with the deep (inside) and superficial (outside) muscles. One of the more common exercises people tell me that they do for “core” is the sit-up. People have traditionally done situps or crunches to strengthen their abs. This primarily strengthens the rectus abdominus. While this can help look good (if you have minimal body fat), this muscle doesn’t provide any stability. By only connecting at your pelvis and up above at your lower ribs, it does not provide any stability for your spine. Overtraining this muscle with sit ups actually puts a lot of compression on your spine and can lead to increased wear and tear or your spinal discs, especially if you flex your spine and let it round out (don’t do that). 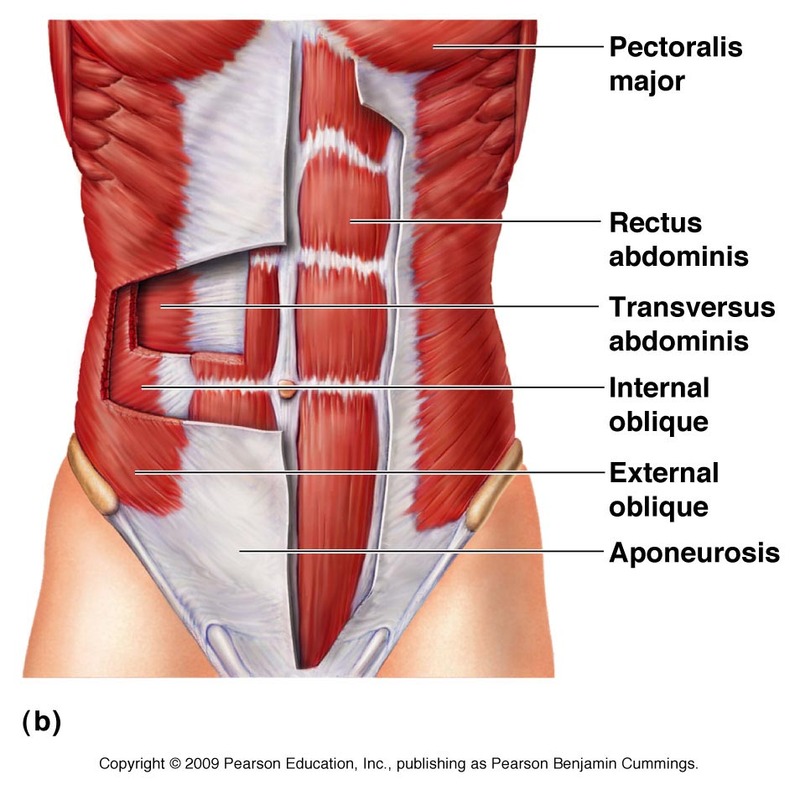 Instead of focusing on this muscle, try to strengthen the deeper ones such as the internal and external obliques as well as the transverse abdominis which connects to every single vertebra in the spine. These muscles help with increasing your intraabdominal pressure which helps to stabilize your spine, as well as give you strength with sidebending and rotation. 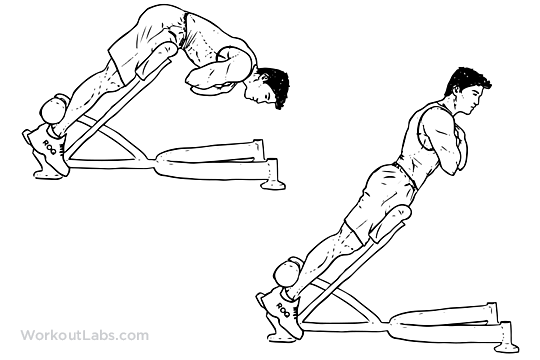 On the back side, many people try to do the back extension exercise. It’s not a horrible exercise, but it’s very easy to do incorrectly by letting your back round out or hyperextend (bend too far backwards leading to compression of your spine). Doing it symmetrically like this also biases the paraspinals (the muscle that goes up and down next to your spine) which often can be hypertonic (overactive) with people with back pain. The paraspinals run up along the spine. Great for moving the spine. Not so great for stabilizing the spine without a lot of compression. To get back strength without compression, you want to focus on the muscles that help support the back extensors. 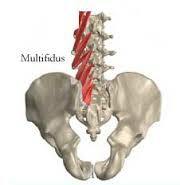 These are your deep back muscles, known as the multifidus and the rotatores. 2) the timing is off and often delayed for these deep muscles, which leads to more low back instability with almost every movement. 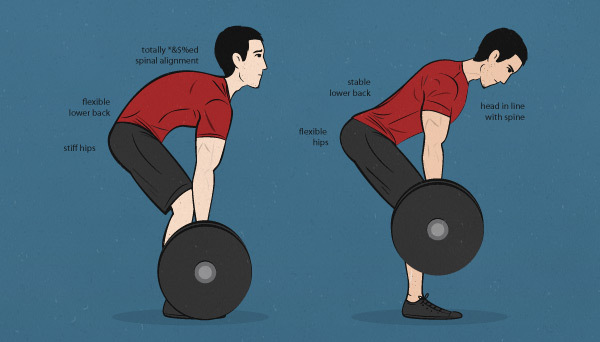 In summary, when trying to strengthen your low back, work on the deep stabilizers. To do this, do exercises that challenge your body’s stability in a diagonal pattern. How do you do this? Read on! Before beginning, all basic back rehab exercises should have the same goal: get strong in the neutral or middle position. This position is generally found when you stand straight up. 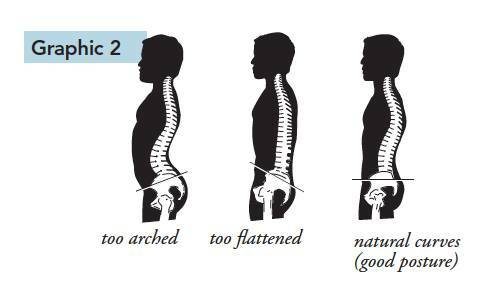 Most of us will have a natural lordotic (concave) curve in the low back. If you held up a stick along your back, your hand should fit right in between the stick and your lower back in the hollow space. When you move and do your exercises, your spine should maintain the same shape. 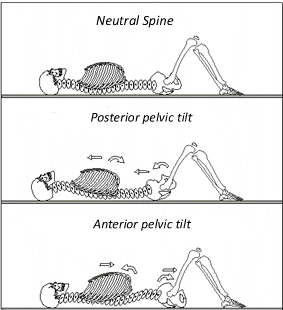 When your spine is in neutral, the muscles are in their strongest position. The joints in the spine are also in their middle position where you will have the most control. There are times when it can be appropriate to move out of neutral, but before training those movements (rowing, lifting an atlas stone in a strong man competition, etc), one should always be able to control their neutral position first. The next 3 posts will include basic low back exercises that will help focus on these concepts. The goal with these exercises is to train these deeper spinal muscles as well as to build awareness of your spinal position without having compression along the spine. Previous Previous post: I Tore My ACL, So When Can I Return to Sport?